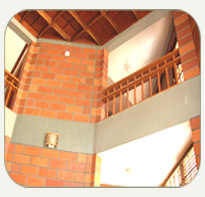 Be it traditional or modern architecture Terracotta is game for roofing, ceiling, flooring and other reasons. Kap India tiles offer you outstanding varieties in all these applications, adaptable to any aesthetic aspects of architecture. The tiles manufactured from our factory excel in quality that count first grade tiles. The use of terracotta as roofing tiles dates back to the ancient period when man first discovered its sheltering possibilities. 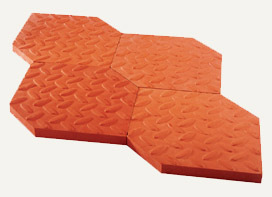 From a flat piece of terracotta he developed tiles with functional aspect like interlocking designs. It was remoulded and reshaped in the in the kiln of man’s imagination that made the exquisite roofing tile ranges today. A much-advanced form of terracotta tile is flooring tiles with stunning patterns and smooth finish. Kap India comes up with designer tiles that adorn the interiors of your home. Beautifully paved, the flooring tiles from Kap India can create wonders in your dream home. Ceiling and wall cladding are the next experiments man made with terracotta tiles. It gave way for pleasing patterns in ceiling and walls tiles that can evoke your admiration. Highly conforming to modern architectural styles, Kap India ceiling and wall tiles prove beyond fact that terracotta is still the user-friendly material of building construction. Man of the medieval period made his abode in clay products. 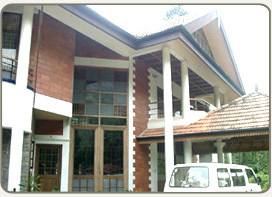 The use of terracotta in ceiling, roofing, flooring, wall cladding and building had been applied first by him. The rich earth with plasticity gave pleasing natural red look and alluring simplicity to his abode. Today Kap India tiles with its variety of exquisite tiles compensate for the lost look of natural beauty in modern habitats. Its traditional and innovative tile ranges rebuild intact the traditional architecture in delightful designs and distinctive patterns. If not for the finish and colour of terracotta, the medieval man would definitely have used it for natural harmony the tiles create with its backdrop. Armed with high resistance power against weather changes, chemical reactions and the like, terracotta soon became an integral part of traditional architecture that has ardent advocates even today. Apart from imparting structural harmony to the households Kap India Tiles and blocks are definitely a step further the contemporary brick and mortar expressions. Being made of the mother earth, that which sustains supports and contains all; terracotta products have a unique power to conform to any surroundings that hold it. 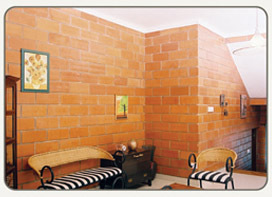 Be it your residence or office, terracotta products bring in peace in terms of red colour and fine textures. 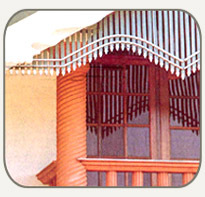 Its unique ability to control the temperature of the atmosphere to a pleasurable level has made it the hot choice of most of modern architects who build in the cities. Its cool touch on the wall and floor inspires your soul and keeps it calm and contented. The terracotta clad home stands for a pleasing environment where you will be breathing cool fresh air even when it is situated in a polluted city. Kap India Tiles provide the best modern solution to tranquil atmosphere that can bestow heaven in terms of peace. An aesthetically pleasing relief from monotonous concrete buildings is what terracotta clad house bestows its modern user. Terracotta imparts rustic appeal to the buildings that are made in a modern style. It exudes a feeling of grandeur that denotes a rich tradition. Modern villas, star hotels and resorts made using terracotta tiles may seem hospitable to an outsider who admires its warm and pleasant interior. Especially in Kerala where torrential rain and exhausting heat are climatic traits, terracotta plays a dual role pleasing in both situations. It controls the humidity in the air permeating heat or cold according to the climate. Kap India Tiles has an exquisite range of terracotta claddings with beautiful patterns and enamouring designs that may turn a modern habitat a paragon of beauty in earthenware. From roofing to lawn paving bricks, Kap India flaunts all pleasing varieties of tiles for the construction of a modern abode. Each tile, which is a masterpiece of precision craftsmanship, contributes to the majestic look of the habitat. From the beginning of modern period itself, attempts have been made to harmonize terracotta with modern functional designs that made way for the scintillating equations of today. Kap India Tiles, famous for their artisan dexterity and tantalizing technological finesse have created quite a following in the industry. Terracotta – a Greek word for earthenware – has been a part of human culture since civilization. With the passage of time, man discovered vast utility base of clay, whether it is earthen pots or a habitat. With the advent of technologies terracotta found new applications that credited man’s imagination. A recent development in that line is terracotta tiling for lawns. 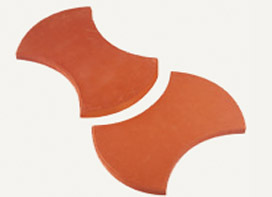 When paved in the garden lawn terracotta tiles augment the beauty of the lawn. Having been made of natural clay, it is a healthier substitute for concrete flooring. The porosity of clay tile creates breathing space for our naked foot and thus binds us directly to earth.